This delicious , elegant and super weeknight dinner was the result of a spur of the moment end of the week, “Oh what should I make with the ingredients on hand” kind of nights. I had just dropped the kids at their swim practice, came home and had about an hour to make dinner and then go back to pick them up. This dinner took me about 30 minutes to make, 15 minutes prep and 15 minutes cooking time. 1. Bring a pot of water to boil, place asparagus into the pot and cook for 5 minutes until the spears are bright green. Remove asparagus from pot and add place them into the bowl of ice water, to stop cooking and preserve the bright green color. 2. Brush flounder fillets with oil, sprinkle with salt, pepper and herbs. 3. 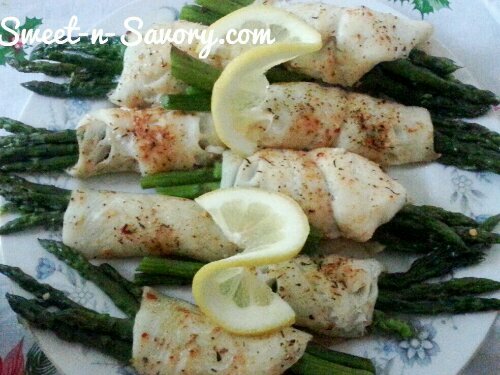 Place the asparagus spears on top of fillets and wrap the flounder around them. 4. Place the fish and asparagus bundles on an baking sheet and bake at 350F for about 15 minutes. 5. Drizzle with a lemony hollandaise and serve with a side of creamy roasted garlic mashed potatoes.